A soon-to-be published book about Eliot Spitzer includes some juicy details about the former governor's fall. 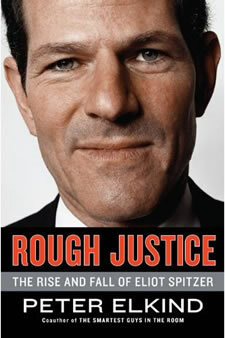 As you might expect, the book also contains some salacious details about Spitzer's, uh, consumption habits. A Marist poll out this week reports that 58 percent of respondents said Eliot Spitzer should not run for statewide office this year. But when asked if he should run at some point, only 48 percent say no. Said Spitzer to Elkind in a recent interview: "I've never said I would never consider running for office again." I believe next to the word "disappointment" in the dictionary is a picture of Eliot Spitzer.